It’s our season finale; join Tilt and Gary as they follow the Yellow Submarine’s animated adventure from 1968. We're back to the Regal for a double feature, as Gary and Tilt discuss Ask A Policeman starring Will Hay and Cannon And Ball's remake, The Boys In Blue. 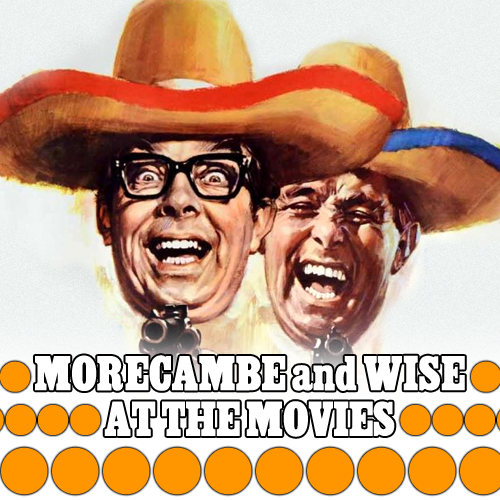 It's Eric and Ern...in colour! Gary and Tilt return to the cinema to discuss The Intelligence Men, That Riviera Touch, The Magnificent Two and Night Train To Murder. 036 - JAFFA THE BEATLES! HELP! We return to the cinema with the Fab Four as Tilt and Gary watch Help! from 1965. Our two-part celebration of the Supermatch game continues as Tilt, Gary and guest beanisacarrot discuss Blankety Blank and its Australian equivalent. In the first of a two-part edition, Tilt, Gary and guest Megan Stemm-Wade discuss the original 'Blankety Blank', Goodson-Todman's Match Game. We're back to the Regal as Tilt, Tyler and Gary enjoy another three British pop movies, this time of a slightly later vintage. It's time to Jaffa the Beatles as Tilt, Tyler and Gary enjoy the Fab Four's big screen debut. We're off out for an evening's entertainment (and the odd glass of champagne) as Tilt and Gary explore the music hall era. It's out, brothers, out as Gary and Tilt explore industrial action on British television from 1968 - 1987. We're back! Tilt and Gary return for a new season with the swinging sounds of 1950s British pop via three films: Rock You Sinners, Six-Five Special and Expresso Bongo. It's our Christmas special, and we're off to the pantomime! Gary, Tilt and guest contributors discuss their memories of the seasonal theatrical tradition. Join us as Gary and Tilt from Jaffa Cakes For Proust dissect the Christmas Day schedules from 1985. It's time to unveil ITV's seasonal selection box as we plunder the All-Star Comedy Carnival, packed with mini episodes of the network's best sitcoms.